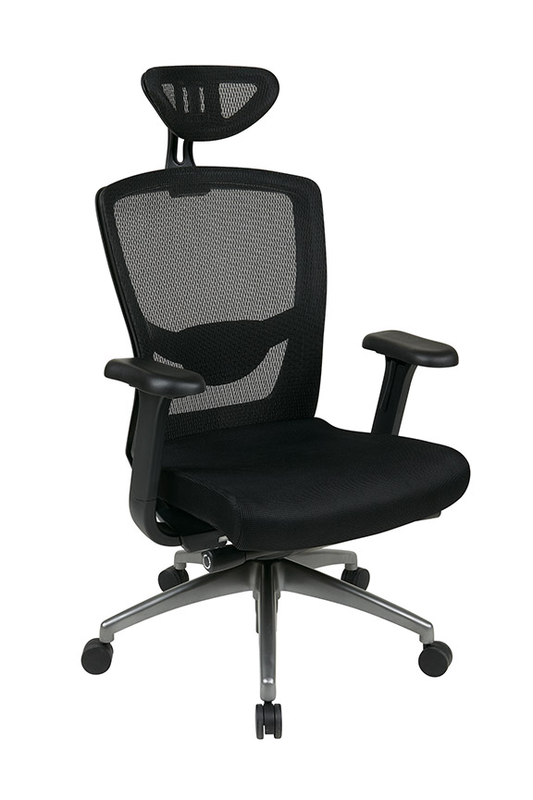 Work in comfort and style in the new Executive ProGrid® back Managers Chair. Perfect for workers who spend extended periods of time at their work stations, this intelligently designed chair provides comfort and support to both your body and mind. The amazingly strong yet lightweight breathable ProGrid® Mesh back conforms to your body's unique contours with added adjustable lumbar support, and high quality molded foam fabric seat affords for hours of cozy seating, minimizing fatigue and alleviating pressure on the spine. The one touch pressurized pneumatic seating adjustments allow you to elevate to the perfect height while The Deluxe 3-position Locking 2-to-1 synchro tilt control with seat slider will let you recline with comfort and ease. Complete with flip up arms and durable titanium finish base with dual wheel carpet casters that provide for effortless mobility across tile and carpet floors alike. With advanced design and quality construction, this seating option is no doubt an office favorite. Add to cart now for online savings on this durable office chair.